A few years ago I purchased a cheap (well it wasn't that cheap, but was not Go pro prices) and some basic accessories to go with it. Amongst these were a car mount and a chest mount. These were all fine but sometimes I wanted to mount the camera in a different position or use it under water without the fear of dropping it to the bottom of the ocean (there was this one time!). 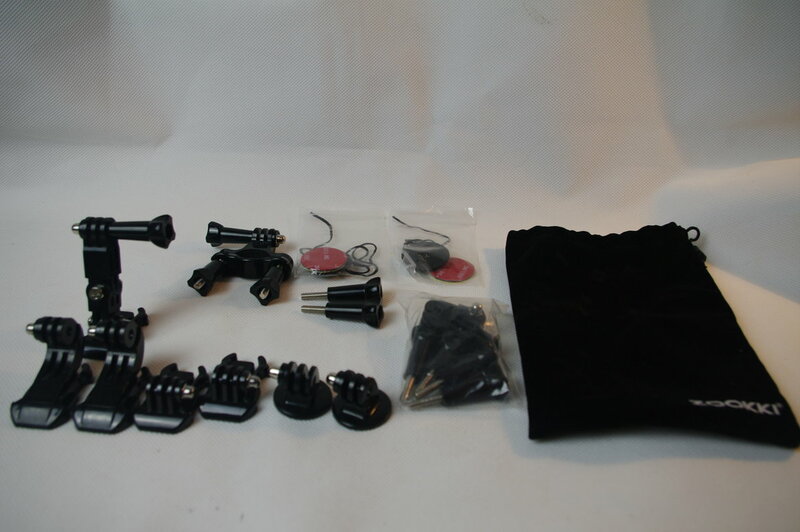 Then along came the Zookki Go pro Action Camera Accessories kit which I found on Amazon. This kit is awesome as it contains so much stuff. It was all delivered in a clear grip seal bag and once opened and laid out I could see how much stuff there was. Inside the bag I found a float which ties to the waterproof housing of my GoPro/Action camera and enables it to float, this is a great bit of kit and much better than the 2 foam feet that I got for free in Majorca a couple of years ago. Next was a chest mount which secures the camera in the center of my chest, a wrist mount to mount the camera on my wrists or something similar in size. Also in the bag was a head strap mount to strap the camera to my head, a strap to secure a remote control to something and a large bulldog style clip with a mount on to secure the camera to something like a strap. Also inside the bag was a selfie stick and a car mount. There were also several sticky mounts in both curved and flat designs and some strange J mount which I'm not quite sure how to use. The really cool items though were in the black cloth bag which also comes with the kit and sports the KOOKI logo. Inside this bag were various mounts to attach action camera to helmets or bikes as well as a full 360 degree mount which enables mounting of a camera on a flat or curved sticky mount and should get you any angle you desire. Now the best part about this kit is the price. I paid nearly £20 for a car mount and a chest mount when I got my action camera. Right now this entire set is on sale on Amazon for £15.99 which really is a bargain. 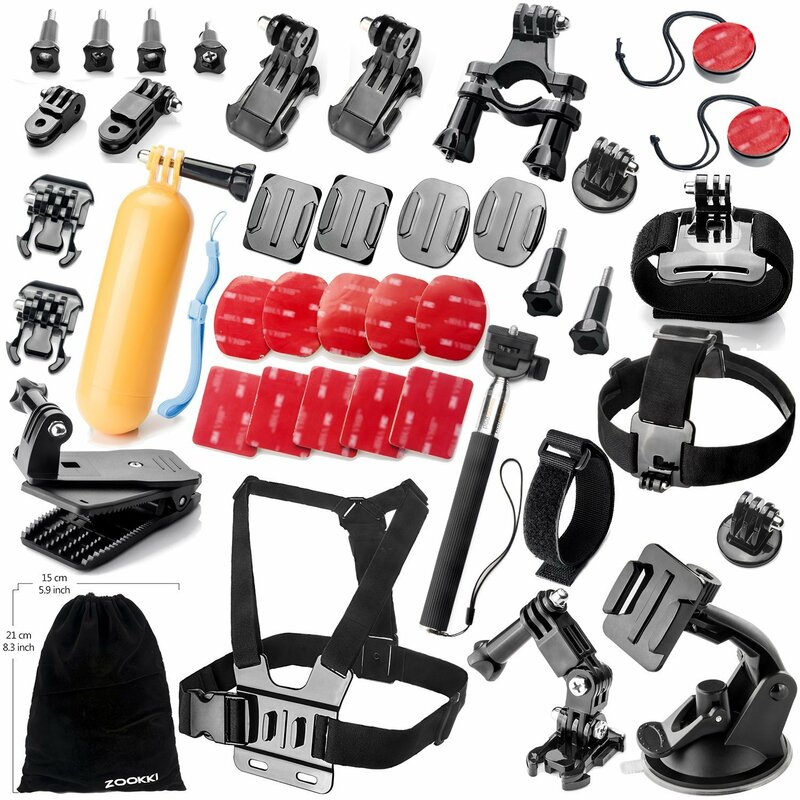 My advice is that if you need a sports camera accessories kit then look no further.